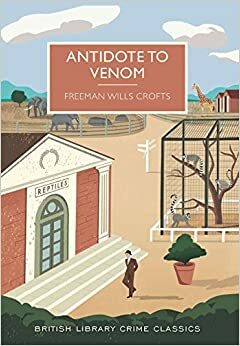 I was in the mood for another murder mystery, but I had read a lot of Christie recently and am a bit bogged down in Sayers Gaudy Night so I looked out my copy of the recently reprinted Antidote to Venom by Freeman Wills Crofts. I had one of his books a while ago, and remembered that it was well written, but very dependent on trains. Now while the husband is a bit of an expert, my eyes tend to glaze over a bit at the mention of timetables and impossible journeys. This book does not mention trains (well, possibly incidentally, but certainly not as important plot devices), and is really well written. The main character, George, is all too human, too understandable, with money worries but a worryingly one dimensional wife. He is in charge of a zoo, which gives him a position in society, but not as much money as he would like. This becomes important as he takes on another lady in his life. The death in this book is not as predictable as the reader is expecting, and it swerves one way and another among a small but well drawn group of characters. It is by no means a predictable book, and the style owes more to the Golden Age writers than modern gritty writing. It is elegantly written, the main character is engaging, and the book draws you in, and keeps you reading. I notice that the British Library is going to produce more by this author, and they will be worth looking for if you are interested in great crime writing. While on the subject, would it be possible for The British Library Publishing wing to produce a list of when they are releasing reprints in this series? I’ve spent a lot of time hunting for them on a certain website, then seeking them out in my local independent bookshop. I am finding out about them more by accident than design though! Or if not a list, a website highlighting them? I have tried ploughing through the online shop range, but it’s still too general. I am enjoying these books far too much to miss out!